Today there began the “Per mille strade verso Roma” – “For a thousand roads to Rome” event, a meeting of prayer between the Holy Father and young Italians sponsored by the Italian Episcopal Conference in preparation for the 15th Ordinary General Assembly of the Synod of Bishops on the theme “Young people, the faith and vocational discernment” (3-28 October 2018). 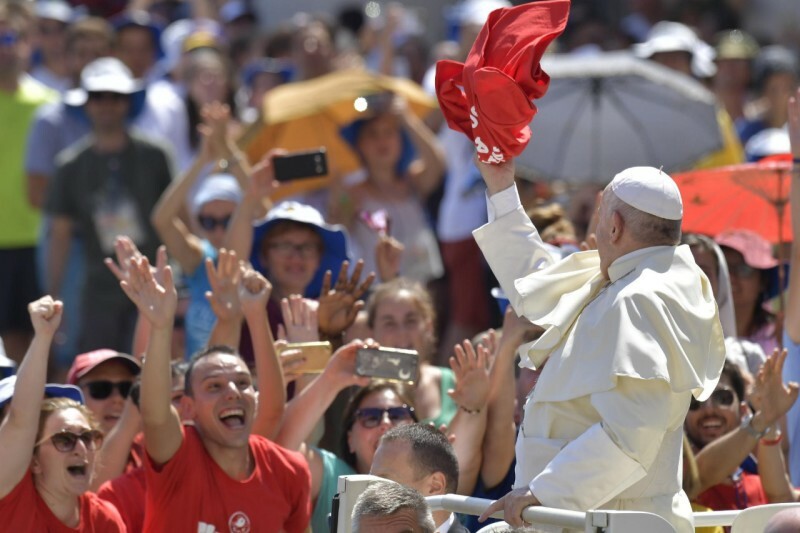 At 16.30, after the arrival during the morning of tens of thousands of young people from almost 200 Italian dioceses, and their reception at the Circus Maximus, there was a moment of entertainment as they awaited the Holy Father. At 18.30 Pope Francis arrived at the Circus Maximus for the meeting and prayer with the young. After a tour by popemobile in the meeting area and greetings to the Holy Father from a representative of young Italians, there began the Pope’s dialogue with a few young people. Then, after a moment of hymns, prayers and testimonies, Pope Francis greeted those who would follow the nocturnal vigil with an evening of celebrations, music and testimonies, then transferring from Circus Maximus to Saint Peter’s Square, pausing in various Churches of Rome throughout the night, during which they will participate in various appointments linked to spirituality, art and culture, shows and entertainment. Dear Pope Francis, I am Letizia, I am 23 years old, and I am studying at university. I would like to say a word about our dreams and how we see the future. When I had to make the important choice of what to do at the end of my last school year, I was afraid to trust what I really dreamed of wanting to become, because it would have meant completely uncovering myself in the eyes of others, and of my own. I decided to entrust myself to the opinion of some adults whose profession and choices I admired. I turned to the professor that I esteemed the most, the professor of art, the one who teaches the things I find most interesting. I told him I wanted to follow his path, to become like him. And I received the answer that now it was not as it used to be, that times have changed, that there was a crisis, that I would not find work, and that it would be better to choose a field of study that better responded to the needs of the market. “Choose economics”, he told me. I felt a great disappointment; I felt betrayed in the dream that I had confided to him, when instead I was looking for an encouragement from the figure I wanted to imitate. In the end, I chose my path, I chose to follow my passion and I study art. Instead, one day, in an oratory where I am an educator, one of my girls told me to trust myself, to value my own choices. She told me that I was almost a role model for her and that she would like to do what I was doing. It was there, at that moment that I consciously decided that I would fully take on the commitment to become an educator: I would not be that traitorous and disappointing adult, but I would give my time and energy, with all the hardships it might entail, because a person had trusted in me. Sometimes I have tried to draw my future. But at the end I see something that does not satisfy me. I will try to explain: I think that we draw it, but often we happen to start out from a grand design, a sort of great fresco from which, to our dismay, gradually we remove some details, we remove pieces. The result is that our plans and dreams, out of fear of others and their judgement, end up being smaller than they were at the outset. Good evening. I will tell you the truth: I knew your questions and had already prepared an answer, but also – hearing them – I would like to add something spontaneously. Because the way in which they have asked the questions goes beyond what is written. You, Letizia, used a very important word, which is “dream”. And both of you said another very important one: “fear”. These two words will enlighten us a little. Dreams are important. They keep our outlook broad, they help us to embrace the horizon, to cultivate hope in every daily action. And the dreams of the young are the most important of all. A young person who does not dream is anaesthetized; he cannot understand life, the power of life. Dreams wake you up, they carry you ahead, they are the brightest stars, those which indicate a different path for humanity. So, you have in your heart these shining stars that are your dreams: they are your responsibility and your treasure. Make them also be your future! And this is the work you must do: transform the dreams of today into the reality of the future, and this takes courage, just as we have heard from both of you. To the girl they said, “No, no, study economics because with this you will die of hunger”, and to the boy, “Yes, the plan is good but let’s take away this piece, and this, and this…”, and at the end nothing remains. No! God ahead with courage, courage in the face of resistance, difficulties, all that which would extinguish our dreams. Certainly, dreams must be made to grow, they must be purified, put to the test and also shared. But have you ever asked yourselves where your dreams come from? My dreams, where do they come from? Were they born from watching the television? Listening to a friend? Daydreaming? Are they great dreams or are they little. meagre ones, that satisfy as little as possible? The dreams of comfort, the dreams only of wellbeing: “No, no, I am all right like this, I won’t go ahead”. But these dreams will make you die, in life! They will turn your life into something that is not great. The dreams of tranquillity, the dreams that send the young to sleep and make a courageous youth one who instead stays on the couch. It is sad to see young people on the couch, watching life pass by in front of them. Young people – I have said it before – without dreams, who “retire” at 20, 22 years of age: what a bad thing, a young pensioner! Instead, the youth who dreams of great things goes ahead, he or she doesn’t retire early. Do you understand? Like that, young people. And the Bible tells us that the great dreams are those capable of bearing fruit. the great dreams are those which bring fruitfulness, which are capable of sowing peace, of sowing fraternity, of sowing joy, like today; these are the great dreams in which we think of everyone as US. Once, a priest asked me a question: “Tell me, what is the opposite of ‘I’? And I naively fell into the trap and said, “you”. “No, father, that is the seed of war. The opposite of “I” is “we”. If I say: the opposite is you, then I make war; if I say that the opposite of selfishness is “we”, I make peace, I make community, I carry ahead the dreams of friendship and peace. Think: the real dreams are the dreams of us. The great dreams include, involve, are extrovert, they share, they generate new life. And great dreams, to remain as such, need an inexhaustible source of hope, an Infinite that breathes into them and opens them up. The great dreams need God so as not to become mirages or a delirium of omnipotence. You can great of great things, but by yourself it is dangerous, because you can fall prey to the delirium of omnipotence. But with God do not be afraid: go ahead. Dream big. And then, the word you used, “fear”. Do you know? The dreams of young people scare adults a bit. They scare them, because when a young person dreams, he goes far. Perhaps because they have stopped dreaming and risking. Very often life causes adults to stop dreaming, to stop risking; perhaps because your dreams challenge their life choices, dreams that lead you to criticise, to criticise them. But do not let yourselves be robbed of your dreams. There was a boy, here in Italy, twenty, twenty-two years of age, who started to dream and to dream big. And his father, an important businessman, tried to convince him otherwise but he said, “No, I want to dream. I dream what I feel inside”. And in the end, he went away, to dream. And his father followed him. And that boy sought refuge in the bishopric, he took off his robes and gave them to his father: “Let me go on my path”. This young man, an Italian of the thirteenth century, was called Francis and he changed the history of Italy. Francis risked so he could dream big; he knew no boundaries and ended his life dreaming. Let us think: he was a young man like us. But how he dreamed! They said that he was mad because he dreamed in this way. And he did so much good, and continues to do so. The young scare adults a bit because adults have stopped dreaming, they have stopped risking, and they have organised themselves well. But as I said before, do not let yourselves be robbed of your dreams. “And how can I make sure, Father, that no-one robs me of my dreams?” Look for good teachers capable of helping you to understand them and to make them real, gradually and with serenity. Be good teachers in turn, teachers of hope and trust towards the new generations who will follow you. “But how, I can become a teacher too?”. Yes, a young person who is capable of dreaming becomes a teacher, through his or her witness. Because it is witness that shakes and moves hearts, and shows the ideals that everyday life covers up. The dream is a great strength. “Father, where can I buy the pills that make me dream?” No, those no! Those will not make you dream, they will send your heart to sleep. They will burn out your neurons. Dreams cannot be bought. Dreams are a gift, a gift from God, a gift that God sows in your hearts. Dreams are given to us freely, but so that we give them away freely to others too. Offer your dreams: no-one, taking them, will impoverish you. Offer them to others freely. Dear young people: “No” to fear. What the teacher said to you? Was he afraid? Yes, perhaps he was afraid; but he had sorted everything out, he was calm. But why did he not want a girl to take the same path? He frightened you. And what did he say? “Study economics: you will earn more”. This is a trap, the trap of having, of setting yourself up in wellbeing and not being a pilgrim on the path of your dreams. Take a risk on that path: do not be afraid. Take a risk, because you will be the ones to realize your dream, because life is not a lottery: life is realized. And we all have the capacity to do it. Saint Pope John XXIII said: “I have never met a pessimist who achieved anything good” (Interview by Sergio Zavoli with Msgr. Capovilla in Jesus, no. 6, 2000). We must learn this, because it will help us in life. And fear makes us pessimistic. No pessimism. Risk, dream and go ahead. In effect, I find it difficult to say I am engaged. I prefer instead to say that I “am with” someone: it is simpler! It involves less responsibility, at least in the eyes of others. Within, though, I strongly feel the wish to commit myself and to plan and build a life together, starting now. So I wonder: why are the desire to build authentic relations and the dream of forming a family considered less important than others, and must be subordinate to pursuing professional realization? I perceive that adults expect something of me: that first I reach a profession, then I start to be a “person”. We need adults who remind us of how beautiful it is to dream together as a couple! We need adults who have the patience to be close to us and thus to teach us the patience of being next to someone; who listen to us profoundly and teach us to listen, rather than always to be right! We need points of reference, impassioned and solid. Do you not think that the figures of truly stimulating adults are rare on the horizon? Why are adults losing the sense of society, of mutual help, of commitment for the world and in relationships? Why does this at times also affect priests and educators? I believe that it is always worth being mothers, fathers, friends, siblings… for life! And I don’t want to stop believing this! Martina is brave, isn’t she? She rattles our stability, and she speaks with fire! I would like to ask her if she is a relative of Saint John Crysostom for how she speaks, so strongly, with such force! To choose, to be able to decide for yourself would appear to be the highest expression of freedom. To choose and to be able to decide for yourself. And in a certain sense it is. But the idea of choice that we breathe today is an idea of freedom without bonds, without commitments and always with an escape clause: “I choose… but…”. She put her finger in the wound: choosing that for our entire life, the choice of love… There too we can say, “I will choose, not now, but when I finish my studies”, for example. That “I choose, but…”: that “but” blocks us, it does not let us go, it does not let us dream, it takes away our freedom. There is always a “but”, which at times becomes greater than the choice, and suffocates it. And in this way freedom disintegrates and does not keep its promises of life and happiness. And so we conclude that freedom too is a deception and that happiness does not exist. Dear young people, the freedom of each person is a great gift, a gift that is given to you and which you must nurture to make it grow, to make your freedom grow, to develop it; freedom does not admit half measures. And she pointed at the greatest freedom, which is the freedom of love; but why must I finish my university career before thinking of love? Love comes when it wants to – true love. Is it a bit dangerous, to speak to the young about love? No, it is not dangerous. Because the young know well that when there is true love and when there is simple enthusiasm dressed up as love: you distinguish between them well, you are not stupid! And for this reason, let us have the courage to speak about love. Love is not a profession: love is life and if love comes today, why must I wait three, four, five years to make it grow and make it stable? In this I would ask parents to help the young to mature when there is love, so that love matures, not to move them ahead and say, “No, because if you get married how, then the children will come and you will not finish your career, and all the effort we have made for you”; we have all heard this story. In life, instead, we must always put love in first place, but true love; and there you must learn to discern, when there is true love and when there is just enthusiasm. “Why do I find it difficult to say I am engaged?” That is, to show, to display that new identity card in my life. Because there is a world of conditioning. But there is another thing that is very important: “But you, do you want to get married?” “But, let’s do something: you go ahead in this way, pretend not to love, study, and then start to live a double life”. The greatest enemy of love is the double life: do you understand? Or must I be clearer? The greatest enemy of love is not only not letting it grown now, waiting until your career is underway, but to live a double life, because if you start to love that double life, love is lost. Why do I say this? Because in true love, the man has a task and the woman has another task. Do you know which is the greatest task of a man and a woman in true love? Do you know? Totality: love does not tolerate half measures. Either all or nothing. And to make love grow, it is necessary to avoid short cuts. Love must be sincere, open, courageous. In love you must put all your meat on the flame, we say in Argentina. There is something in the Bible that strikes me greatly: at the end of the Creation of the world, it says that God created man in His image and likeness, and says, “He created them male and female, both in his image and likeness”. This is love. When you see a wedding, a couple of a man and a woman who go ahead in the life of love, there is the image and likeness of God. What is God like? He is like that marriage. This is the image and likeness of God. It does not say that man is the image and likeness of God. No. Both of them, together, are the image and likeness of God. And then it continues, in the New Testament: “a man will leave his father and his mother and be united to his wife, and the two will become one flesh”. This is love. And what is the task of the man in love? To make his wife or fiancée more of a woman. And what is the task of the woman in love? To make her husband or fiancé more of a man. It is a job for two, who grow together; but the man cannot grow alone, in the marriage, if he does not make his wife grow, and the woman cannot grow in marriage if she does not make her husband grow. And this is unity, and this is what it means to be a single flesh: they become one, because one makes the other grow. This is the idea of love and of marriage. Do you think that an ideal like that, when you feel it is true, when it is mature, must be moved ahead for other interests? No, it must not. It is necessary to risk in love, but in true love, not in amorous enthusiasm dressed up as love. So, we must ask ourselves: where is my love, where is my treasure? Where is the thing I consider most precious in life? Jesus speaks about a man who had sold everything he had to buy a precious pearl of very high value. Love is this: selling everything to guy this precious pearl of very high value. Everything. This is why love is faithful. If there is infidelity, there is no love; or it is an ailing love, or a small one, that does not grow. Selling everything for one thing. Think well of love, think about it seriously. Do not be afraid of thinking of love: but the love that risks, faithful love, the love that makes the other grow, so they grow mutually. Think of fruitful love. I have seen here, as I toured, some children in their parents’ arms: this is the fruit of love, true love! Take a risk on love! In life the moments in which I have been confronted with faith are rare and sometimes I have understood that doubts exceed the certainties, the questions I ask have answers that are not tangible and which I can not touch, sometimes I even think that the answers are not plausible. I realize that we should spend more time on this: it is so difficult in the midst of the many things we do every day … And it is not easy to find a guide that has time for exchange and research. And then there are the great questions: how is it possible that a great and good God (as they have told me) allows injustice in the world? Why do the poor and the marginalized have to suffer so much? My work puts me daily in front of death, and seeing young mothers or family fathers abandoning their children makes me ask: why allow this? The Church, bearer of the Word of God on earth, seems increasingly distant and closed in its rituals. For young people the “impositions” from above are no longer sufficient, we need proof and a sincere witness of the Church that accompanies us and listens to us for the doubts that our generation poses every day. Pointless glories and frequent scandals now make the Church barely credible in our eyes. Dario put his finger in the wound and repeated the word “why” more than once. Not all “whys” have an answer. Why do children suffer, for example? Who can explain this to me? We do not have the answer. Only, we will find something by looking at Christ crucified and His Mother: there we will find a way to feel something in the heart that is an answer. In the Lord’s Prayer (cf. Mt 6:13) there is a request: “Lead us not into temptation”. This Italian translation has recently been adjusted to the precise translation of the original text, because it could sound ambiguous. Can God the Father “lead us” into temptation? Can He fool His children? Of course not. And therefore the true translation is: “Do not abandon yourself to temptation”. Keep us from doing evil, free us from bad thoughts … Sometimes the words, even if they speak of God, betray His message of love. Sometimes we are the ones who betray the Gospel. And he spoke of this betrayal of the Gospel, and he said: “The Church, bearer of the Word of God on earth, seems increasingly distant and closed in its rituals”. What he said is strong; it is a judgement on us all, and also in a special way for – let us say – pastors; a judgement on us, the consecrated ones, the consecrated ones. He told us that we are increasingly distant and closed in our rituals. Let us listen to this with respect. It is not always the case, but sometimes it is true. For the young, impositions from above are no longer sufficient: “We need proof and a sincere witness of the Church that accompanies us and listens to us for the doubts that our generation poses every day”. And he asks all of us, pastors and faithful, to accompany, to listen, to bear witness. If I am a Christian, a lay faithful, a lay faithful, a priest, a nun, a bishop, if we Christians do not learn to listen to suffering, to listen to problems, to be silent and to let people talk and listen, we will never be able to give a positive answer. And so many times the positive answers can not be given with words: we must give them, risking ourselves in testimony. Where there is no testimony, there is no Holy Spirit. This is serious. Of the early Christians it was said: “Look how they love each other”. Because people saw the testimony. They knew how to listen, and then they lived as the Gospel says. Being a Christian is not a status of life, a qualified status: “I thank you, Lord, because I am a Christian and I am not like others who do not believe in you”. Do you like this prayer? (they answer: no). This is the prayer of the Pharisee, the hypocrite; this is how hypocrites pray. “But, poor people, they do not understand anything. They did not go to catechesis, they did not go to a Catholic school, they did not go to the Catholic university … but, they are poor people …”: is this Christian? Is it Christian or not? (they answer: no) No! This is a scandal! This is a sin. “I thank you, Lord, because I am not like the others: I go to Mass on Sunday, I do this, I have an orderly life, I confess, I am not like the others …”. Is this Christian? (they answer: no) No. We have to choose witness. Once, in a lunch with young people in Krakow, a young man told me: “I have a problem at university because I have a partner who is agnostic. Tell me, Father, what should I say to this agnostic companion to make him understand that ours is the true religion?” I said, “My friend, the last thing you have to do is tell him something. Begin to live as a Christian, and he will be the one to ask you why you live like that”. Dario continued: “Pointless glories and frequent scandals now make the Church barely credible in our eyes. Holy Father, with what eyes can we reread all this?”. The scandal of a formal Church, not a witness; the scandal of a Church that is closed because she does not reach out. Every day he [Dario] must come out of himself, whether he is happy or sad; he must go out to caress the sick, to give the palliative care that will make their transit to eternity less painful. And he knows what it means to come out of himself, to go to others, to go beyond the boundaries that give security. In Revelation there is a passage in which Jesus says: “I knock at the door: if you open, I will come in and will dine with you”: Jesus wants to come to us. But I often think of Jesus knocking on the door, but from inside, because we let him go out, because we often, without witness, hold him prisoner to our formalities, our closures, our selfishness, our clerical way of life. And clericalism, which is not just clerics, is an attitude that affects all of us: clericalism is a perversion of the Church. Jesus teaches us this path of exit from ourselves, the path of witness. And this is the scandal – because we are sinners! – that we do not go out of ourselves to give testimony. I invite you to ask – to Dario or to someone else – who does this work, who is able to come out of himself, to give testimony. And then, to reflect. When I say “the Church does not bear witness”, can I also say this about myself? Do I bear witness? He can say it, because he bears witness every day, with the sick. But I can say that? Can any one of us criticize that priest, that bishop or that other Christian, if he is not able to come out of himself to bear witness? Dear young people – and this is the last thing I will say – Jesus’ message, the Church without witness, is just smoke. I thank you also because this appointment was preceded by an intertwining of many paths on which you have become pilgrims, together with your bishops and priests, along the roads and paths of Italy, amid the treasures of culture and faith that your forefathers left as their legacy. You have travelled through the places where people live and work, full of vitality and marked by hardships, in cities as well as in villages and remote hamlets. I hope you have breathed deeply the joys and difficulties, life and faith of the Italian people. In the passage of the Gospel we have heard (cf. Jn 20: 1-8), John tells us of that unimaginable morning that changed forever the history of humanity. Let us imagine it, that morning: at the first light of dawn of the day after Saturday, around the tomb of Jesus, everyone starts running. Mary of Magdala runs to warn the disciples; Peter and John run towards the tomb … Everyone runs, everyone feels the urgency to move: there is no time to waste, we must hurry … As Mary had done – remember? – as soon as conceived was Jesus, to go to help Elizabeth. The disciples of Jesus run because they have received the news that the body of Jesus has disappeared from the grave. The hearts of Mary Magdalene, Simon Peter, and John are full of love and beat wildly after the separation that seemed definitive. Perhaps the hope of seeing the face of the Lord again is rekindled in them! As on that first day when he had promised: “Come and see” (Jn 1:39). The one who runs the fastest is John, certainly because he is younger, but also because he has never ceased to hope after seeing Jesus die on the cross with his own eyes; and also because he was close to Mary, the Mother, and in this way he has been “infected” by her faith. When we feel that faith is weaker or tepid, let us go to Her, Mary, and She will teach us, she will understand, she will make us feel the faith. Since that morning, dear young people, history has no longer been the same. That morning changed history. The hour when death seemed to triumph, is shown in reality to be the time of its defeat. Even that heavy boulder, placed before the tomb, could not resist. And from that dawn of the first day after Saturday, every place where life is oppressed, every space in which violence, war, misery dominate, where man is humiliated and trampled – in that place a hope of life can still be rekindled. Dear friends, you set off and have come to this meeting. And now my joy is to feel that your hearts beat with love for Jesus, like those of Mary Magdalene, of Peter, and of John. And because you are young, I, like Peter, am happy to see you run faster, like John, driven by the impulse of your heart, sensitive to the voice of the Spirit that inspires your dreams. This is why I say to you: do not be content with the prudent step of those who wait at the end of the line. do not be content with the prudent step of those who wait at the end of the line. It takes courage to risk a leap forward, a bold and daring leap to dream and realize like Jesus the Kingdom of God, and to commit yourselves to a more fraternal humanity. We need fraternity: take risks, go ahead! I will be happy to see you running faster than those in the Church who are a little slow and fearful, attracted by that much-loved Face, which we adore in the Holy Eucharist and recognize in the flesh of our suffering brother. May the Holy Spirit drive you in this race forward. The Church needs your momentum, your intuitions, your faith. We are in need! And when you arrive where we have not yet reached, have the patience to wait for us, as John waited for Peter before the empty tomb. And another thing: walking together, these days, you have experienced how hard it can be to welcome the brother or sister who is next to me, but also how much joy his presence can give me if I receive this in my life without prejudice or a narrow mind. Walking alone allows us to be freed from everything, and perhaps faster, but walking together makes us become a people, the people of God. The people of God that gives us security, the security of belonging to the people of God … And with God’s people you feel safe, in the people of God, in your belonging to the people of God you have an identity. An African proverb says: “If you want to go fast, run alone. If you want to go far, go with someone”. The Gospel says that Peter first entered the tomb and saw the cloths on the ground and the shroud folded in a separate place. Then the other disciple also entered, who, the Gospel says, “saw and believed” (verse 8). This pair of verbs is very important: seeing and believing. Throughout the Gospel of John it is said that the disciples, seeing the signs that Jesus performed, believed in Him. Seeing and believing. What signs are these? Water transformed into wine for the wedding; some sick people healed; a blind man who gains his sight; a large crowd satiated with five loaves and two fish; and the resurrection of His friend Lazarus, who died four days beforehand. In all these signs, Jesus reveals the invisible face of God. It is not a representation of the sublime divine perfection that transpires from the signs of Jesus, but the story of human frailty that meets the Grace that lifts up again. There is the wounded humanity that is healed by the encounter with the Master; there is the fallen man who finds an outstretched hand to cling to; there is the loss of the defeated who discover a hope of redemption. And John, when he enters Jesus’ tomb, carries in his eyes and in his heart those signs given by Jesus, immersing himself in the human drama to revive him. Jesus Christ, dear young people, is not a hero immune from death, but rather He who transforms it with the gift of His life. And that carefully folded sheet says it will no longer be needed: death no longer has power over Him. Dear young people, is it possible to encounter Life in places where death reigns? Yes, it is possible. We would want to say no, that it is better to stay away, keep far away. Yet this is the revolutionary novelty of the Gospel: Christ’s empty tomb becomes the last sign in which the definitive victory of Life shines forth. So we are not afraid! We do not stay away from the places of suffering, of defeat, of death. God has given us a power greater than all the injustices and fragility of history, greater than our sin: Jesus conquered death by giving His life for us. And He sends us forth to announce to our brothers that He is the Risen One, He is the Lord, and He gives us His Spirit to sow with Him the Kingdom of God. That morning of Easter Sunday changed history, let us have courage. How many tombs, so to say, await our visit today! How many wounded people, even young ones, have sealed their suffering by placing, as they say, a stone on top of it? With the power of the Spirit and the Word of Jesus we can move those boulders and let beams of light enter into those ravines of darkness. The journey to Rome was beautiful and tiring; think, how much effort, but how much beauty! But equally beautiful and challenging will be the return journey to your homes, to your countries and to your communities. Undertake it with the trust and energy of John, the “beloved disciple”. Yes, the secret is there – in being and knowing that you are “loved”, “loved” by Him, by Jesus, the Lord, He loves us! And each one of us, returning home, put this in your heart and in your mind: Jesus, the Lord, loves me. Undertake with courage and with joy the path towards home, take it with the awareness o being beloved by Jesus. Then life becomes a good race, without anxiety, without fear, that word that destroys us. Without anxiety and without fear. A race towards Jesus and to your brothers, with a heart full of love, faith and joy: go like this!